I’m not really a morning person so I’m a huge fan of the meal known as brunch. You don’t have to be up early to eat it, in fact anytime between 10:30 a.m. to 3:00 p.m. is a good time to serve brunch. A few weekends ago I enjoyed the most spectacular brunch. My wonderful Godmother Connie prepared an absolutely fantastic brunch which served as my bridal shower. 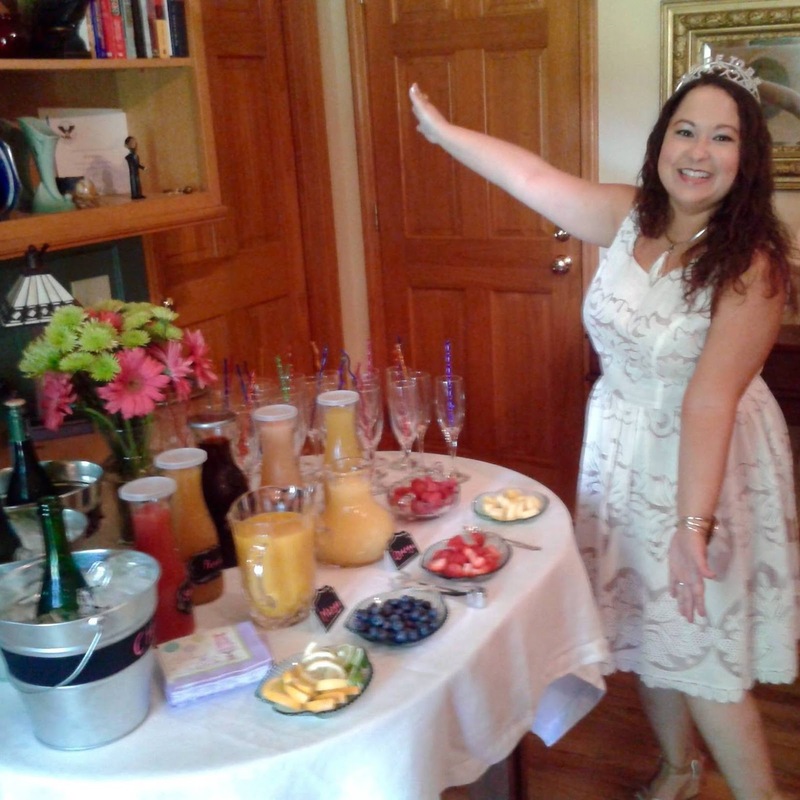 My very favorite part of my bridal brunch, aside from being showered with love by friends and family, of course, was the mimosa bar. Yes, you read that right, a mimosa bar. Mimosas are pretty much the best part of any brunch. Drinking alcohol in the morning is typically frowned upon, but not when it’s brunch and it’s a mimosa. 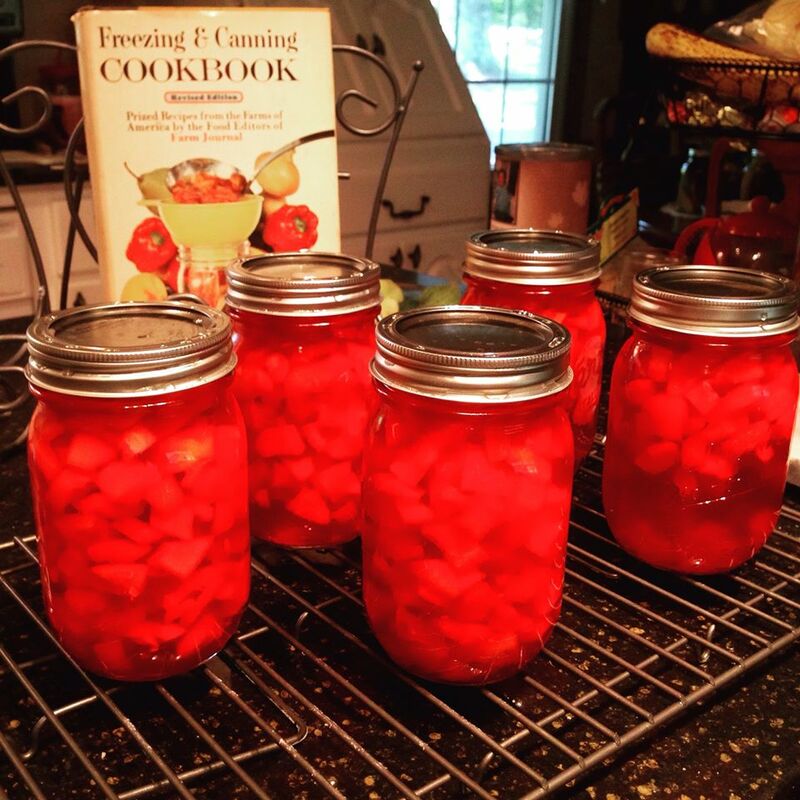 In case you are not familiar with this delightful beverage, it is so very simple to make. A basic mimosa is comprised of orange juice and champagne. My Godmother really went all out for my special celebration and these were not your typical mimosas. Set up in a most delightful tablescape were crystal champagne flutes with colorful swizzle sticks, three different kinds of sparkling adult beverages including Champagne, Prosecco and Moscato, seven different juices, plus multiple kinds of fruit for garnish. 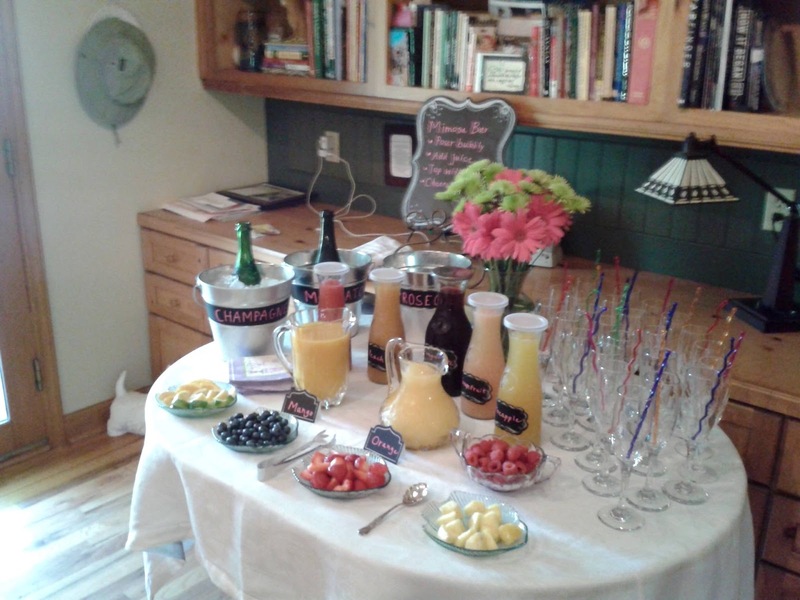 When I’m rich and famous, I want to have brunch with a mimosa bar every single day! My Godmother had all sorts of beautiful flowers and tropical decorations in honor of my upcoming honeymoon in Key West, but she really outdid herself with the mimosa bar. If you plan to host a special brunch event anytime in the near future, I highly recommend making it extra special with fresh fruit, juices and champagne! The dishes served for this brunch were also superb. Connie made delicious mini-frittatas as well as some out-of-this-world french toast casseroles. To top off the brunch menu we had mini crab and shrimp quiches as well as tropical desserts like key lime tarts and piña colada cupcakes. Aside from the mimosas, of course, my favorite was the frittata. A frittata is basically a crustless quiche. Connie used a muffin pan to make the mini frittatas so they were a perfect serving size for each guest. This is another great tip if you are serving brunch for a crowd. You could really take your favorite frittata recipe and make it in the muffin pan to create individual serving sizes. Connie used Food Network chef Ina Garten’s recipe which included proscuitto. Below is a recipe I found for frittata that also sounds delicious from The Girl Who Ate Everything.Com. Preheat the oven to 375 degrees. Spray 2 mini muffin tins (each with 12 cups) with nonstick spray. Whisk the eggs, milk, pepper, and salt in a large bowl to blend well. Stir in the bacon, cheese, and spinach. Fill prepared muffin cups almost to the top with the egg mixture. Sprinkle tops with cheddar cheese. Bake until the egg mixture puffs and is just set in the center, about 8 to 10 minutes. The frittatas will be really puffy right out of the oven and will settle once removed from the oven. Using a knife, run the edge of the knife around the edge and loosen the frittatas from the muffin cups and slide the frittatas onto a platter. Serve immediately.